ST. GEORGE – A man on probation who was previously found guilty of assault in connection with a shooting at a residence on Diagonal Street in St. George in March was again indicted Monday – this time, for allegedly receiving stolen firearms out of Millard County and then pawning them. Edward Dryden Clark was out on probation on the March charges in accordance with an April 6 judgment. On April 16, St. George Police Detective Joshua Wilson was contacted by an investigator with the Millard County Sheriff’s Office who informed Wilson he was working a burglary case in which several firearms had been taken, according to a probable cause statement written by Wilson in support of the indictment. The Millard County Sheriff’s Office made an arrest in the case, the statement said, and, during an interview with the arrested suspect, the suspect told police the stolen guns were at a St. George residence belonging to 40-year-old Edward Dryden Clark. After Millard County officials traveled to St. George in hopes of locating the stolen firearms, they learned Clark had recently been involved in another incident in which he was the suspect in a shooting that occurred at a St. George residence on March 18. On March 19, Clark was arrested on a third-degree felony assault charge for the March 18 incident. On April 6, he pleaded guilty to an amended class A misdemeanor charge and received a five-year prison sentence that was suspended subject to his compliance with probation orders, according to the court docket in that case. A search warrant for Clark’s residence was issued on April 23 with regard to his suspected involvement with the stolen firearms out of Millard County. Clark agreed to meet with Wilson to talk about the situation regarding the stolen firearms, Wilson said in the statement of probable cause. However, Clark never showed up to the agreed meeting. The following day, authorities discovered the location of two of the stolen firearms. One had been pawned at a Washington City pawn shop and the other had been pawned at the Family Pawn in St. George. The Mosin Nagant rifle pawned at the St. George pawn shop was listed as having been pawned by Clark, and was identified as one of the firearms stolen out of Millard County, the statement said. 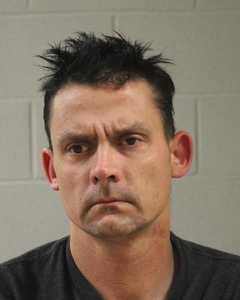 Clark was arrested and booked into the Washington County Purgatory Correctional Facility. He was indicted on a second-degree felony charge of theft by receiving stolen property, and a class B misdemeanor for theft by deception. Judge Eric Ludlow, of the 5th District Court, ordered a $25,000 cash-only bail for Clark’s warrant. Clark was found indigent by the court during his initial court appearance Monday and will be represented by court-appointed attorney Jay T. Winward, the same attorney who represented him in the March assault case. Clark is scheduled to make his next court appearance on May 4. As this report is published, requests made to defense attorney Winward and the county attorney’s office are pending response.